Between costumes, candy, pumpkins and decorations, Halloween can get pretty expensive. In 2014 the National Retail Federation estimated that consumers spent around $7.4 billion on Halloween goodies, with the average person spending about $77. However, we’re here to tell you that it is possible to make savvy purchases to lower your costs. 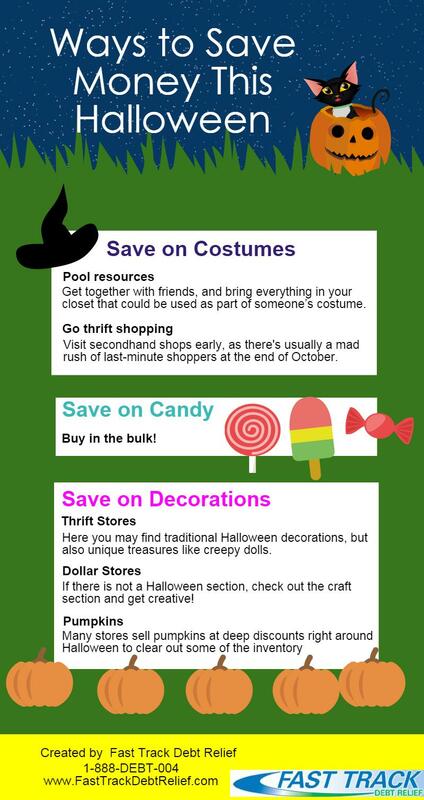 Our infographic below outlines ways to save money this Halloween on candy, costumes and decorations. Little things like visiting thrift shops for costumes and decorations, or buying your candy from a warehouse store like Costco or BJ’s can end up saving you a good amount of money. If you have a good group of friends or neighbors, you can also get together to pool items that can be used as part of someone’s costume. Also don’t forget to visit a dollar store, which will likely have some good stuff for cheap in its Halloween or arts and crafts section. For pumpkins, don’t purchase and carve them too early, or they will be rotten by October 31. Instead, buy a pumpkin the week of Halloween- in fact, you might even get a discount, as many stores sell pumpkins at lower prices in an effort to clear out some of their inventory. Lastly, remember that candy will be up to 75% off the day after Halloween. If you have any upcoming parties, it’s a great time to stock up! At Fast Track Debt Relief we want to make sure people are aware of the perils of debt. For those who are currently in debt, these tips can be invaluable. However, tips like this alone may not be enough, and for those situations we recommend calling us about debt consolidation programs taylor made for you.